The chance to get out on our stunning lake. Whether you're on holiday and looking for a bit of fun or part of a group looking to develop skills, our lake sessions are perfect to add to your activity programme. Choose which activity best suits your needs and then be prepared to get wet! Choose you craft and head for our stunning lake for a session on the water. 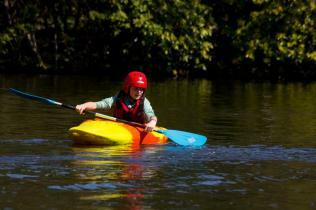 With Canoeing and Kayaking available our instructors will give you a fun and challenging session learning new paddling skills. Avon Tyrrell is the perfect place for any angler. With 2 fully stocked lakes, you can sit back, cast your rod and relax. We have both day and annual passes with a variety of fish to catch plus camping, so check us out for your next fishing trip. If you’re looking for a relaxing session to enjoy views of Avon Tyrrell our Pedalos may be what you need. Hop in and steer the craft with your feet as you sit back and enjoy the lake from a different perspective. 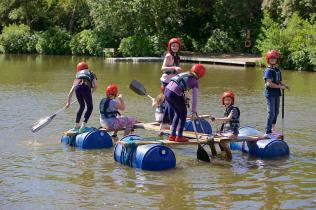 How well can you build a raft? Construct and build a raft with your team before we take it to the water and put it to the test with different challenges. Will you and your team stay dry? Or will you get soaked? Paddle boarding is a NEW exciting, fun and challenging activity at Avon Tyrrell. Enjoy a paddle around the stunning lake and see if you can get up on both feet with support from our instructors.